Another great thing about Lino printing is that the only real difference between an amateur printer, and a professional, is the tools they use. Whether you are using a £10,000 flat bed printing press in a converted barn, or a bit of elbow grease and your dining room table, the process tends to be exactly the same. At the moment, I fall in the latter camp, but I'd be a terrible lier if I said I didn't dream of that converted barn. 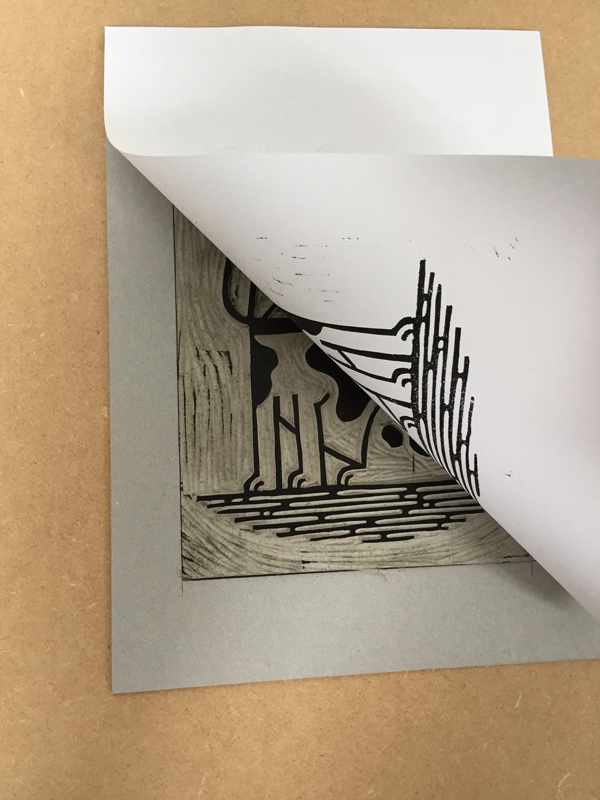 Whenever I make a new print (not nearly as often as I would like) and share on Twitter or Instagram, I get a handful of responses from people saying how much they would like to give Lino printing a go but they don't know where to start, or find the process a little intimidating. With this in mind, I decided to do a little tutorial to show just how easy it is to do at home and get fantastic results. The first stage is simple - design the print. (I say it's simple, but this is the part I often find the most difficult) To keep this guide as simple as possible, the prints are going to be using only 1 colour. I've decided to make a French Bulldog because dogs are ace! Once the design has been transferred I like to go over the pencil with Indian Ink. This gives me a better idea of what the finished print will look like, and also makes it easier to follow the design once I start cutting. If at this point there are any parts of the design I don't like, I can erase the ink lines with a standard pencil eraser. I didn't like the shading on the face so rubbed it out. Now, the block is ready to carve. I place the lino on my bench hook, making it easier to cut the lino without also having to hold it still. I then use the cutting tools to carve the lino, making sure to leave all of the areas that are black. I find it easier to use the fine tool to outline the design before switching to a wider tool to cut the large areas. During the cutting process I use my brush pen to colour in the Lino that hasn't been cut away. This just makes it easier to see how the print will look and also highlights any places that need further cutting adjustments. After a little while, depending on how complex the design is, the block is ready for printing. I use an old paintbrush to sweep all of the little grey bits from the Lino block - if you don't do this, they get mixed up with the ink and it shows on the prints. 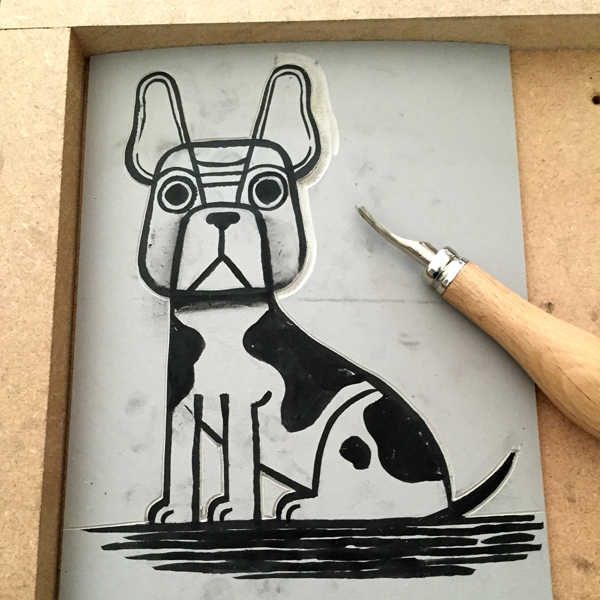 I now have a piece of Lino all carved up and ready to print. To do this I need some ink. I use Daler-Rowney Water-soluable block printing inks. They are oil based so they don't dry out too quickly but can be cleaned up with just some soapy water. I squirt a little bit of ink onto my glass plate - if you don't have a big piece of toughened glass, you can use a plastic tray or something similar - then roll it about until I have a nice even layer or ink on the glass and the roller. I want my finished print to be on A4 paper, but the Lino is only A5. In order for all of the prints to be positioned in the centre of the page, I make a little printing window thingy. I take an A4 piece of card and position the design so it is somewhere in the centre. I then draw around the Lino and cut out the A5 sized rectangle, leaving a hole in the middle. Once I have an nice layer of ink on my roller I simply roll it over the carved Lino block. I do this a few times to make sure that the ink is evenly distributed and then I place the Lino into the window I made earlier. I can now align the prints very easily by making sure the edge of the paper lines up with the edge of the printing window. ...and there you have it. A fresh homemade Lino print. I hope this has been useful to at least one of you. I really recommend giving it a try and would love to see your efforts. If you would like to take one of these puppies home, the finished prints are now available in my shop.